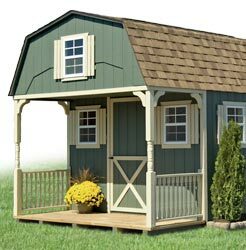 Are you using your shed as a cabin, office building, or in-law quarters? Add a porch to give it that homey feel! 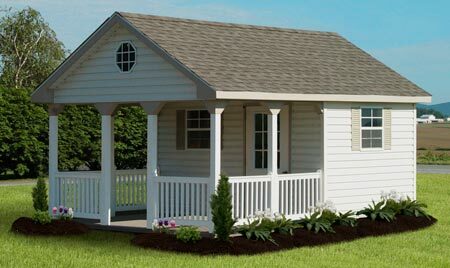 Porches can easily be added to the corner or gable end of your structure. Choose from vinyl or wood posts and railing to match your taste. 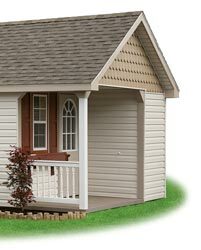 Adding a gable porch is ideal for weekend getaway cabins! Not only does it give you a place to enjoy the great outdoors, it also creates a loft to use as an extra sleeping area. Just add a ladder and mattress and you're set! *Composite decking makes clean up a breeze! Just hose it down and let it dry. Plus it won't weather like traditional decking. It's virtually maintenance free!